Ferric Chloride (also known as Iron Chloride) is used to etch Copper printed circuit (PC) boards. A pattern is either printed or hand drawn with an indelible marker directly on the Copper sheet. The Copper-clad PC board is then agitated under the Ferric Chloride solution for several minutes. 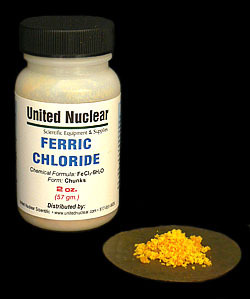 Ferric Chloride is also used as a coagulant in treating sewage and drinking water. Added to a solution of Sodium Silicate, Ferric Chloride crystals will 'grow' and make brown crystals in the well-known 'Chemical Garden' experiment.